I’ll try to avoid going through the round shot by shot (though I could). Instead I’m going to dive into the highpoints / lowpoints of the round and what I can take away from it. Lots of amateurs struggle with focusing on the wrong things or practicing the wrong things. If you hit a driver well, you tend to want to smash drivers all day. I’m looking for where I need to improve and sometimes that may not be swinging a club. Sometimes its lack of confidence or decision making. Some days its all of the above. This was one of those days. I played in a tournament on Sunday at Waterchase Golf Club in Ft. Worth. Steady rainfall all week, combined with 3″ overnight led to a saturated golf course. Even with relatively good drainage, most of the golf course was like playing out of soup. We played lift clean and re-place throughout. The bunkers were not recoverable, so we played them as Ground Under Repair… More on that later. It wasn’t pretty. 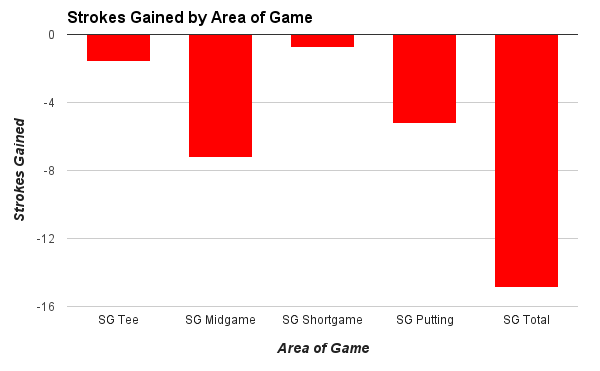 If you want to know how a 2 handicap can shoot 86… you can retrace every regrettable step on GameGolf. It’s hard to find much good in a round in which I shot an 86 and finished towards the bottom of the field, but hey, I’m a glass half full kind of guy. The bright spot in the round was clearly my play off the tee. While I wouldn’t necessarily say that Waterchase is a difficult driving course, there are plenty of places where a hazard or OB will be glad to catch a wayward tee shot. For me personally there are several tee shots that make me uncomfortable. Particularly No. 5, 6, 10, and 17. Depending on the wind direction, several of these holes set you up with a left to right wind and water or hazard on the right hand side. I managed to escape the golf course without a single penalty off the tee. 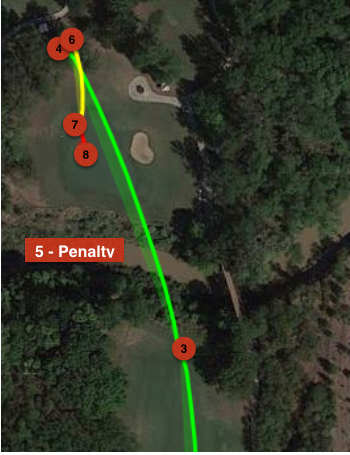 I probably deserved one on 10, but was saved by trees and was able to punch the ball 170 yards into the fairway. From a strokes gained perspective it was certainly a good day off the tee. This round was my best measured performance to date, only losing 1.6 strokes to the average tour pro. In general I would expect my strokes gained to improve as warmer weather dries up the golf courses. Drives were pretty much 100% carry on Sunday with the soggy conditions. My long drive was 282, average was 250. Not great, but not bad for a wet breezy day. Short game was also a bright spot. I gave myself a ton of chances to get up and down for pars and just couldn’t convert the putts. Therefore scrambling statistics weren’t great, but it wasn’t the fault of the wedges. It is difficult to hit those short chips off of wet muddy conditions. The slightest miss is penalized. I feel like I did a good job of using the bounce to keep from chunky misses. So many things I could pick, but I’ll go with what has been plaguing me in tournaments… the flatstick. It really couldn’t have started worse. I missed a 6 footer on the first after a good chip shot from a short-sided position. I second guessed the amount of break I read and missed on the low side. I then went on to three-putt the second hole after a tentative first putt left me a 3.5 footer. Other than the 12 footer I made on hole 6 for birdie, there weren’t many bright spots. I missed 6 putts that were 6 feet or less and only made a total of 47 feet of putts (the tour average is around 75 feet). I had three 3-putts. That just won’t cut it. And thus, I lost 5.26 strokes to a tour pro with the flatstick. So why was my putting so poor? Honestly, I was hitting the putts where I intended, my speed was decent. The problem was second guessing breaks. I over-corrected for misses from earlier in the day. I was also tentative early in the round. Afraid to run it 5 feet by and so I struggled to get it to the hole. The greens were slower as you’d expect from all the rain, but I couldn’t convince myself to hit it. Still no excuse to putt that poorly from close range. The Par 5’s… I was +9 on the par 5s… I didn’t know that was possible. Now this is a course with 5 of them… so that helps (hurts?) The worst part, is that on 4 of the 5 I was in perfect lay-up position after two shots. I had a wedge or low iron in my hand with a chance to hit the green in regulation… If you would have given me that position before I played the hole, I would have taken in on each of those holes. In other words, I did the difficult part. I put a tee ball in play, laid up to a good yardage in the middle of the fairway… and then totally wet the bed. I could see the top of the ball in some tall grass. I had a 10% chance of making contact that would get the ball over the creek. Against my better judgement I tried to hit it. Let’s just say the ball looked more like a frog jumping into the creek than it did a golf shot. It went maybe 1 foot before splashing. A few shots later its snowing in Texas in May (ie. I made a snowman -> 8). 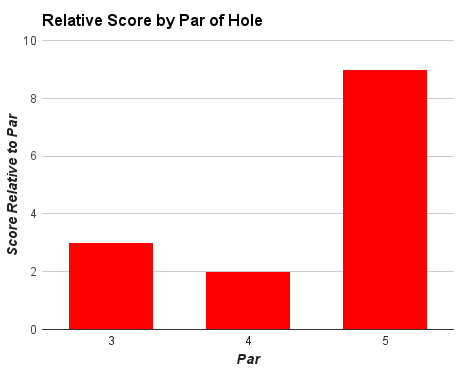 The other par 5s were less comical, but equally depressing as the best I could muster was a bogey. Par 5s are scoring holes and I just simply choked. With the exception of #10 they aren’t even particularly difficult holes. I didn’t play the par 3s particularly better as I shot +3 on them with a birdie on one of the five. Just uninspired golf. Despite the horrendous start, through 8 holes I was okay with how horrible the day had been. I made great birdies on 7 and 8 to climb back to +5 and thought I had a low back 9 in me. I stood on 9 tee and smoked a driver down the left hand side. The ball ended up hugging the right edge of a bunker. We were playing the bunkers as ground under repair due to the rain, however we weren’t sure whether or not you got relief from ground under repair for interference with your stance. Mainly because if it were a hazard, you don’t get relief. The rules are confusing remember? So I elected to use rule 3-3 and play two balls. I intended to score the one with free relief. For the ball without relief, the ball was about 18″ above my feet. I had to choke to the metal and still the toe of the club was way up in the air. I took a full swing, but only advanced the ball 30 yards or so into the rough. That was fine, I didn’t think it would count. I set up over the ball in which I took free relief. Contact felt like a gun going off in my hand. I crushed it. I immediately knew that I had hit it too far. Despite my pleading, “Get down sweetheart!” The ball flew right over the flag and carried into the lake behind. I’m in trouble. I still had to play out both balls. I proceeded to stuff the ‘no relief’ ball to about 10 feet from 140 yards and made the putt for a par. I was able to get up and down with the ‘relief’ ball for bogey… The bogey counted. You do get stance relief from ground under repair. The hole didn’t totally destroy the round on its own, but it took some wind out of my sails after I had started mounting a comeback. I bogeyed the difficult 10th and never recovered. I finished 7th out of 9 players in my flight. A smaller field for the Dallas GCAT tour. The birdie on 8 at least won me a skin, so I went home with some cash in my pocket. I need to do better than this to earn that trip to Nationals. Even par wins almost every tournament on the Golf Channel Am Tour (GCAT) and Sunday was no different. The winning score was right at even par. I’m good enough to compete with that, but I need to start getting out of my own way. I can accept rusty swings and making mistakes due to lack of practice, but I have to stop making mental mistakes and shaking my confidence. I know practice and trust go hand in hand. The more you practice, the easier it is to trust. I don’t have that luxury, nor am I asking for it. I’m not trying to give up time with my son and wife to be a tour player. However, I do want to be the best I can be. There has to be balance, even if its tricky. My swing has been solid lately, but I’m lacking that trust in tournaments. So my biggest take away from the round, its better to trust the shot and accept whatever result (such as flying the green on #9 into the lake) than it is to second guess what you are doing and have it affect the shot. Commit. You’re good enough.